Happy National Waffle Day! Perfect for a crowd or just a quick treat - S’mores Sliders are kid-friendly and delicious! What’s better than s’mores? Whether you’re camping or not – s’mores instantly make everything better. I mean, chocolate and marshmallow – come on! It’s like a kid’s dream come true! I remember the first time we took the boys camping and the first time they had s’mores. Reece did a double-take as I pulled out the marshmallows and Hershey’s chocolate bars. The boys had such a fun time roasting their marshmallows and then sandwiching it between graham crackers. There’s a reason why it’s a classic. What could possibly be better than s’mores? 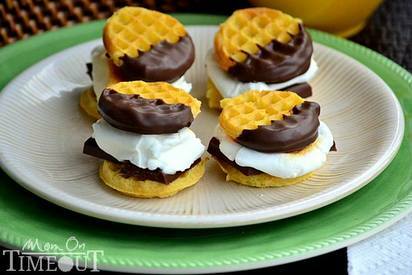 Maybe, just maybe sandwiched between two chocolate-dipped waffles? Yeah. I think so. Prepare mini waffles according to package instructions and let cool. Temper your chocolate or melt candy coating according to package instructions and dip waffles in chocolate. Let harden. Place marshmallows on a baking sheet under broiler for 3-4 minutes. Watch carefully and remove when golden. Break Hershey's in half and place on one mini waffle. Top with roasted marshmallow and second waffle. Enjoy!